Beginning in 1957, Faulkner agreed to serve terms as the writer-in-residence at the University of Virginia in Charlottesville, a move no doubt motivated by the fact that his daughter and their growing family lived nearby. As writer-in-residence, he agreed to participate in question-and-answer sessions with students, faculty, and faculty spouses. Tapes from these sessions were later transcribed to produced Faulkner in the University, edited by his English Department colleagues Frederick Gwynn and Joseph L. Blotner. The latter would go on to write the quintessential biography of Faulkner, a two-volume set aptly titled Faulkner: A Biography in 1974, which he would follow with an updated, condensed one-volume edition ten years later. 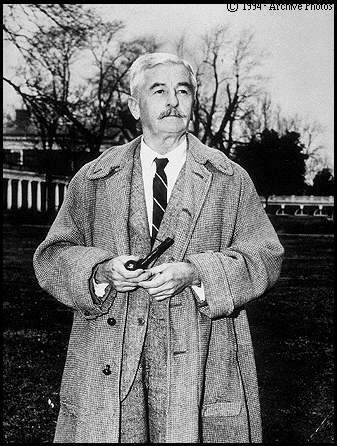 Faulkner would continue to divide his time between Charlottesville and Oxford for the rest of his life, and he bequeathed the bulk of his personal papers and manuscripts to the Alderman Library at the university to form the William Faulkner Collections, the single largest collection of Faulkner papers and memorabilia anywhere in the world. Some of the more interesting and unusual items in the collection can be seen online in the library's "The Most of Special Collections: Most Faulknerian" exhibit. This page has been accessed 2901 times. About this page counter.